I love the stunning view behind the couple in this photo. Last year I had the privilege of photographing their West Hills Country Club wedding. Nestled in Middleton, New York, the property was first developed as a golf course way back in 1899. It’s been through a lot of changes since then, and it makes a fantastic wedding venue for brides in search of a classic, traditional wedding. It features three distinct spaces for your ceremony or reception. A classic indoor ballroom, semi-permanent tended outdoor ballroom, and the open courtyard. The outdoor ballroom has a wooden dance floor, with carpeting covering the rest of the floor for guests’ comfort. The ceiling features sweeping drapery drawn up with large hanging light fixtures and ceiling fans to keep guests cool. The open sides let in the green outdoors. The courtyard is perfect for outdoor ceremonies. The curved brick patio is edged with hydrangea bushes and the focal point is a domed pergola on a raised platform at the front of the space. The experienced events team is well-prepared to put together perfectly executed nuptial celebrations from the first signature cocktail, to the sundae bar. Onsite catering makes the planning process easy. Keep an eye out for their quarterly tasting events. Floor-length linens are included. The club has a well-appointed spacious bridal suite with large windows which will allow for gorgeous photos of the bridal party getting ready. West Hills Country Club weddings are an outstanding choice for couples who, like the Swartz’s, value having onsite catering and event staff to streamline planning and simplify their day-of moving pieces. 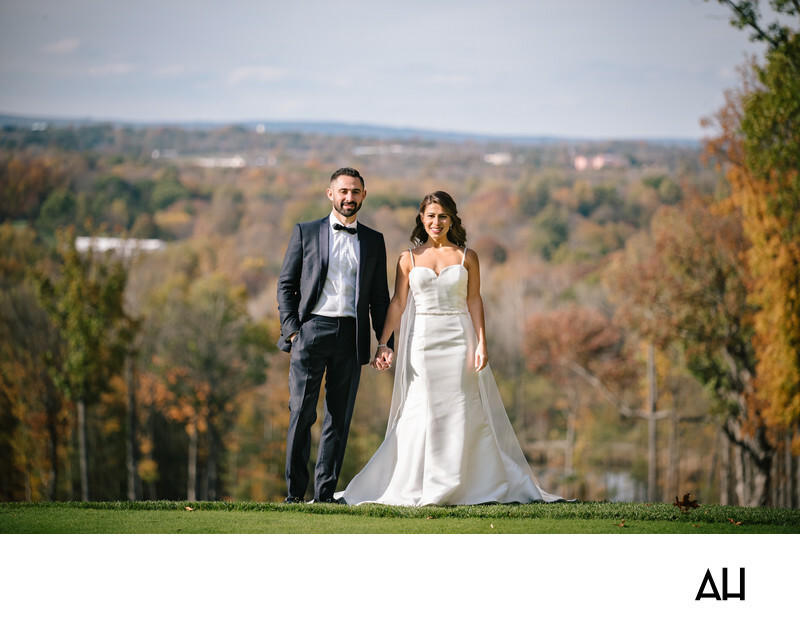 Plus, the country club has plenty of perfect photo locations for the first look and couples’ portraits including a wooden footbridge, pond with waterfalls, winding brick pathways, and of course the manicured rolling green hills.